This winter DMF will be proposing to implement two new conservation measures for the striped bass fisheries aimed at minimizing the number of fish that are killed through hooking and releasing. The proposed measures would prohibit the use of gaffs and mandate the use of in-line circle hooks when using live or cut natural baits. 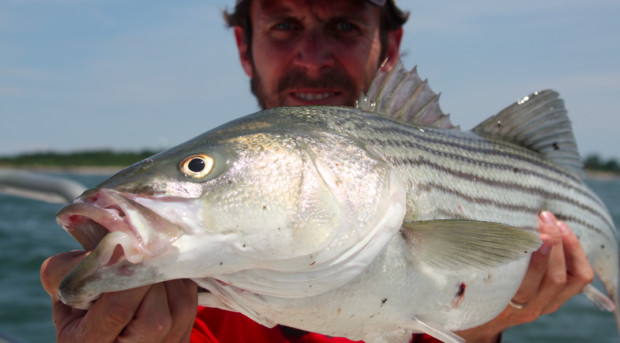 The Massachusetts recreational striped bass fishery is primarily catch and release. Our anglers release about 93% of all the striped bass they catch. Discards in the commercial striped bass fishery, though difficult to quantify, are also believed to make up a significant share of the catch, especially given the larger minimum size for that fishery. Studies have shown that about 9% of released striped bass will die from the effects of hooking and handling (called release mortality). Given that recent stock assessments have shown that fishing mortality is increasing, we think it is time to institute some broad-based and effective measures to lower the mortality rate and ensure the future health of the striped bass stock. We have heard from many anglers that feel a no-gaffing rule in the striped bass fishery is a no-brainer. Using a gaff to assist in bringing your catch aboard causes significant injury to the fish and there is often no way to tell the precise length of this fish until it is removed from the water. Given that our fisheries release large numbers of striped bass that are just below the legal size limit, we feel it is irresponsible to continue to allow the practice. Numerous other Atlantic coast states have already implemented such a provision in their striped bass fisheries, including Maine, New Hampshire, Connecticut, Maryland, and Virginia.